Geophysics in the Affairs of Man describes how geophysics has affected human affairs, with emphasis on the geophysical enterprise as an interplay of technical, social, and economic factors. Many of the key and intriguing developments that took place within several major fields of geophysics are divided into seven epochs, roughly broken into decades. Topics covered include the origins of the profession of geophysics, earth physics and oceanography, and geophysical aspects of undersea warfare. This book is comprised of nine chapters and begins with a discussion on some antecedents to the modern-day profession of geophysics through World War I. The following chapters focus on the golden days of exploration geophysics; classical seismology during the war years; the growth of geophysics during the 1950s; and the nature of the geophysical exploration industry. 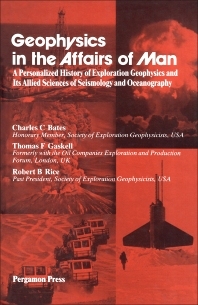 The closing chapter presents the views of numerous geophysicists about what they consider the most outstanding actions they were ever involved in, as well as what makes the profession unique. This monograph is written primarily for geophysicists, geologists, and geological engineers. Should there be a Nuclear Test Ban? Military Oceanography Thrives during "Peacetime"
Are Bigger and Better Seismic Arrays the Route to Go? Is Mankind Modifying the Earth? By what Means will Geophysics Progress into the Future?